...and he’s on it: Randy’s listening... No, REALLY, he’s listening. Randy’s listening... No, REALLY, he’s listening. 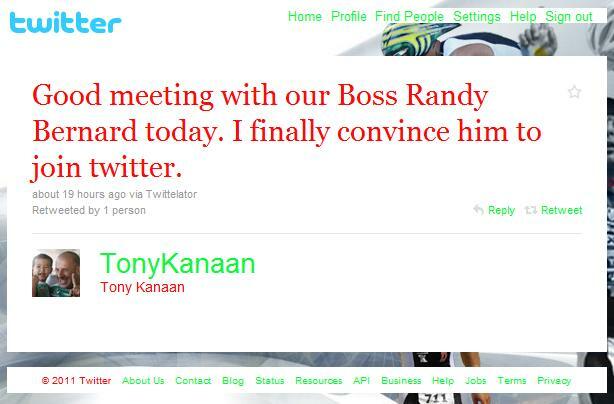 Knowing Randy Bernard’s kooky philosophy of actually wanting to hear what fans have to say about the state of the IZOD IndyCar Series, I’ve often wondered if, maybe, he was covertly monitoring Twitter as a way of gauging fan feelings. After all, Twitter’s where it all goes down, right? Well, we now have confirmation he does, indeed, walk among us. The point? The leader of the IndyCar Series is a fan-friendly STUD (until proven otherwise) and he is listening to what you have to say. So, all the more reason to (respectfully) tweet your concerns, or votes of confidence, about the greatest racing series on the planet, because who knows what the Series’ response might be? ...and, Mr. Bernard, if you’re in earshot, I heart you, man.